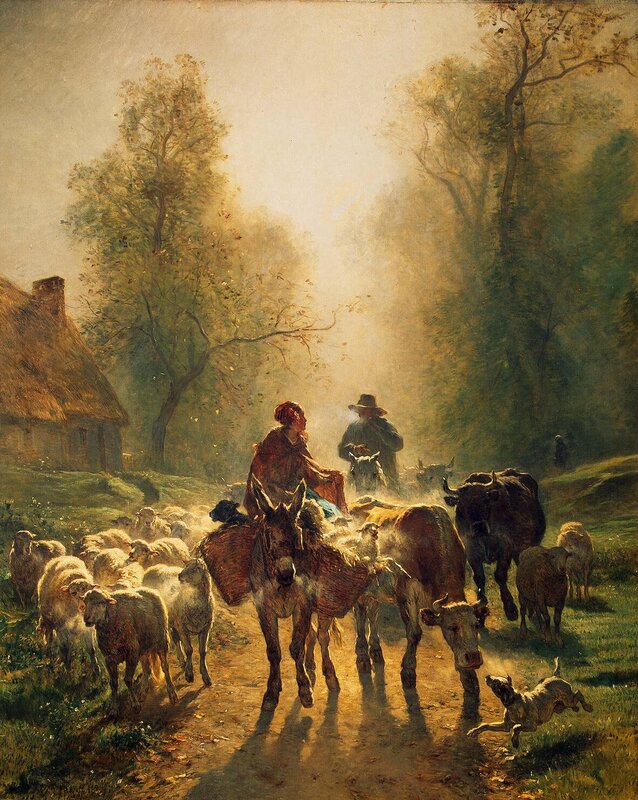 Huw Wystan Jones (1820-1888), On the Way to Market (1859), oil on canvas, 260.5 × 211 cm, National Museum of Wales, Cardiff. Wikimedia Commons. In the next few days, there should be an announcement of the ‘discovery’ of a new member of the Impressionists, from the two institutions which have painstakingly pieced together his works, biography, and their documentary archives, largely from the Mouton-Rothschild Collection. I am delighted to be able to bring you a little preview, to celebrate his birthday, today, the first of April. Huw Wystan Jones (1820-1888) was born in the Welsh fishing village of Llareggub, on the west coast of Wales, over a century before it was made famous in Dylan Thomas’s play Under Milk Wood. He studied painting first at the Swansea Art School, where he learned to paint in watercolours and oils, but in the Spring of 1839 left prematurely and made his way to Paris. Failing to gain entry to the Académie des Beaux-Arts there, he worked in Delacroix’s studio, developing his technique and skills. His early paintings, at least those that have survived, were strictly realist and in Salon style. However his motifs were unusual, and he quickly showed a preference for painting sheep in rural settings. From about 1850 he often travelled to paint in Normandy, and later in Brittany too, where he met the young Eugène Boudin. Jones soon discovered a practical problem with painting sheep: it was not wise to bring them into a studio. He was therefore driven to paint almost entirely en plein air, and it was he who inspired Boudin to do the same. Huw Wystan Jones (1820-1888), A Sheep Market in Normandy (1850), oil on canvas, 59 x 84 cm, National Museum of Wales, Cardiff. Wikimedia Commons. 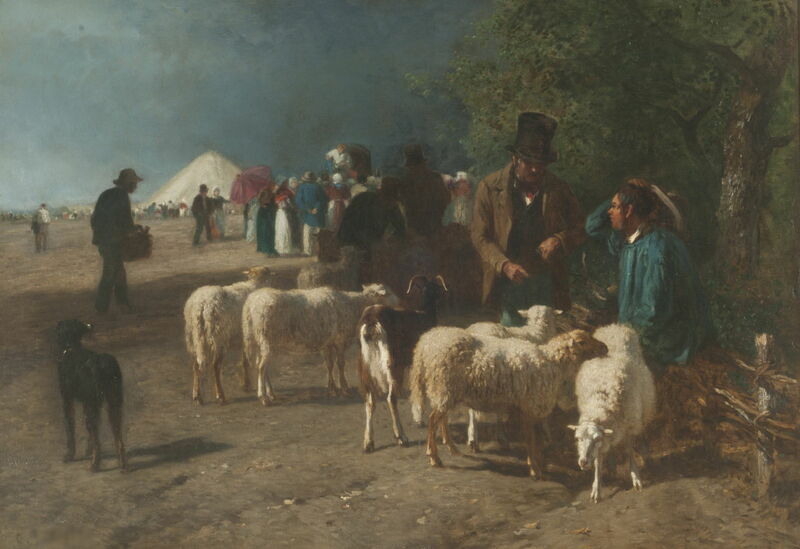 Early works such as A Sheep Market in Normandy (1850) show clear influence of the Barbizon School, although he does not appear to have frequented sites around Fontainebleau where others tended to gather and paint. Huw Wystan Jones (1820-1888), The Return of the Flock (1858), oil on canvas, 100.2 x 161.4 cm, National Museum of Wales, Cardiff. Wikimedia Commons. During the 1850s these paintings started to explore the effects of light more, and their facture became steadily rougher, anticipating the changes which were to be seen in Monet and Renoir a decade later. It was Jones who first introduced Monet to Boudin in 1857, and helped persuade the young Monet to paint landscapes. Huw Wystan Jones (1820-1888), On the Way to Market (1859), oil on canvas, 59 x 84 cm, National Museum of Wales, Cardiff. Wikimedia Commons. Jones was bitterly disappointed when his exceptional On the Way to Market (1859) was refused by the Salon jury in 1859, and Boudin’s entry was accepted, but Boudin and Monet were able to rebuild his confidence so that he could resume painting the following year. Sadly few of his works from the 1860s seem to have survived, as he had to abandon them in France when the Franco-Prussian War broke out in 1870. He returned to his family in Wales, where he concentrated on studies in which he tried to capture the optical properties of the fleece of the local Cardiganshire sheep, whose wool is so distinctive as to have been the origin of the name of the knitted ‘cardigan’ jacket. Working initially in watercolour, he made little headway. When he changed to oils, though, he realised that the solution was to break his brushstrokes up into ever finer marks. Huw Wystan Jones (1820-1888), The Shepherdess Bringing in Sheep (1872), oil on canvas, 46 x 55.2 cm, Musée d’Orsay, Paris. Wikimedia Commons. 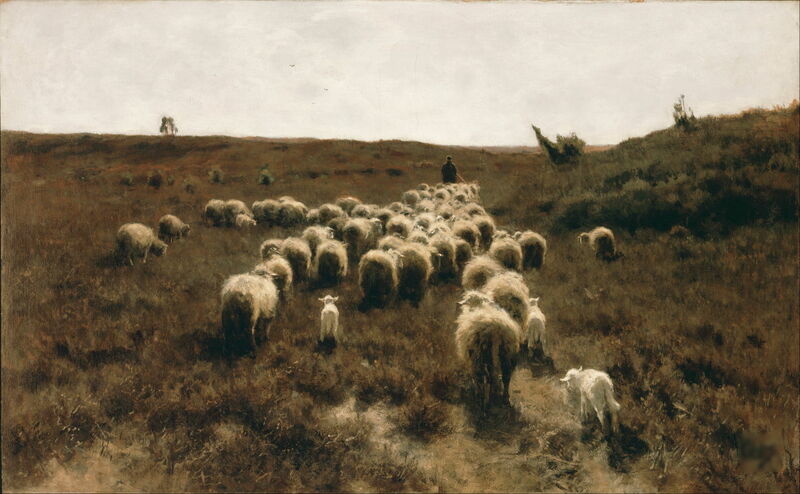 His first finished painting using this technique, which he termed pointillage, was The Shepherdess Bringing in Sheep (1872). Still smarting from his previous experience with the Salon jury, he submitted this to the Royal Academy in London, who rejected it. Huw Wystan Jones (1820-1888), A Flock of Sheep (1873), oil on canvas, 46 x 55.2 cm, Musée d’Orsay, Paris. Wikimedia Commons. This time Jones did not stop painting, but pressed on, convinced of eventual success. His A Flock of Sheep was sent to the Royal Academy the following year, and was also rejected. Huw Wystan Jones (1820-1888), Landscape with a Flock of Sheep (1875), oil on canvas, 60.3 x 73.7 cm, Musée d’Orsay, Paris. Wikimedia Commons. 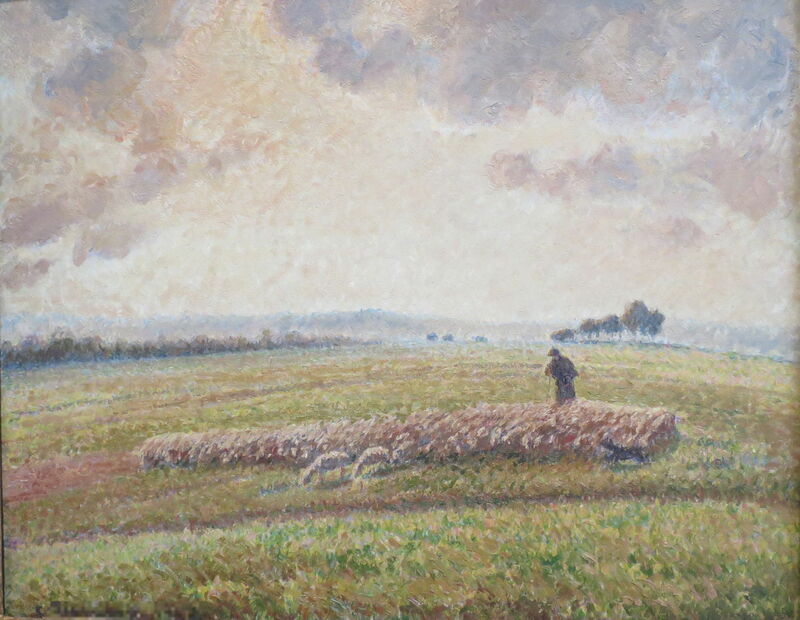 Jones’ last painting which remains is his Landscape with a Flock of Sheep (1875), completed too late for the First Impressionist Exhibition of 1874, and once again rejected by the Royal Academy. However by this time he was living on the Boulevard de Magenta, had met the Seurat family, and befriended their son Georges, who was just starting his training at the local École Municipale de Sculpture et Dessin. 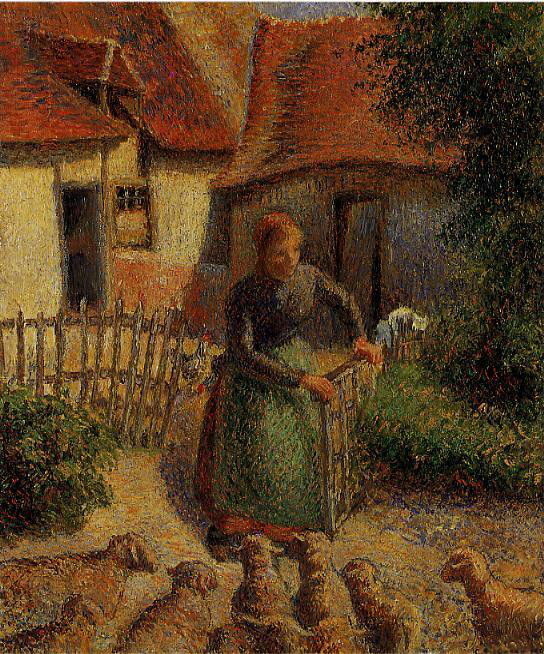 Re-examination of Seurat’s papers has confirmed that it was Jones who was actually the father of Neo-Impressionism. When Seurat started to develop Neo-Impressionism in the early 1880s, it was too late for Jones. He returned to the village of his birth in 1877, and made a comfortable living painting local views in watercolours for the gentry and early tourists. 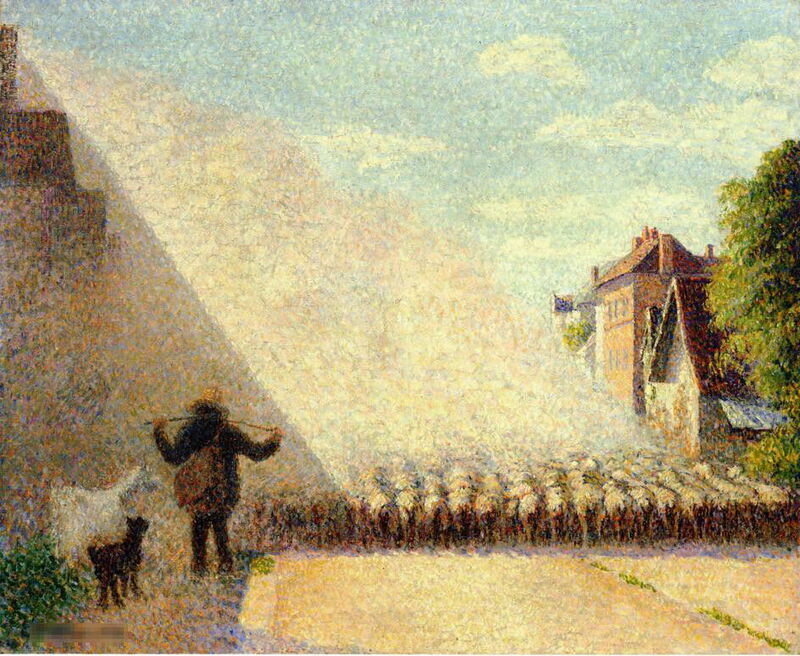 He returned to Paris in the Spring of 1886 – just 130 years ago – to see Seurat’s A Sunday Afternoon on the Island of La Grande Jatte (1884-6) on display, and two years later died in a freak farming accident, when a flock of sheep ran out of control during a storm. What day could be more appropriate to celebrate the newly-discovered influence of the Welsh Impressionist? Posted in General, Language, Life, Painting and tagged April, Boudin, Impressionism, Jones, Neo-Impressionism, realism. Bookmark the permalink.